On stage a sheep is grazing. It has no eyes but nevertheless from time to time fixes a gleeful audience member with a truculent stare. 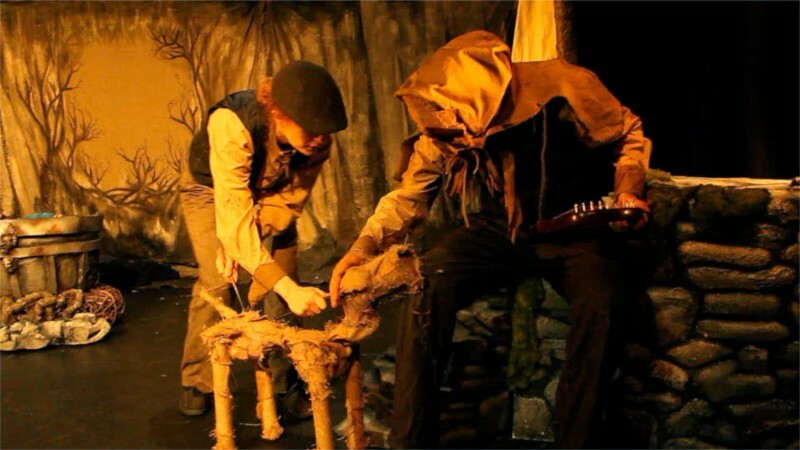 This characterful living sheepskin is only the first of a wild array of beautifully crafted puppets that animate this tale of Welsh mythology. Emerging company Puppet Soup have concocted a story that weaves together several classic myths, focussing on the iconic red dragon immortalised on the Welsh flag. It’s a vast canvas they draw on, beginning with an epic battle that shakes the mountains and taking in a whole lifetime’s work spent carefully guarding an egg. There are potent symbols of good and evil: a singing goddess hovering over her magic cauldron, a deathly white snake whose only purpose is vengeance. These are not simple or gentle stories but they are presented with a warmth that is infectious. PuppetSoup exhibit a sharp understanding of visual storytelling and the needs of younger audiences. They structure their material carefully – we begin with the distant, magical storytelling of shadow theatre and evolve toward increasingly spectacular puppets. There is much direct address, bilingually in English and Welsh which, to a non- speaker, simply adds a rich layer of atmosphere to proceedings. The puppets, by Fagner Gastaldon, are evocative and striking. The skull-like head of the white snake is genuinely unsettling and there’s some lovely play with scale, as the magical egg grows. Mountains appear and disappear, magical kingdoms are revealed inside tree trunks, journeys across oceans and through dreams are brought convincingly to life through clever design elements and a pleasing array of puppets that retain a seriousness without becoming twee or Disneyfied. Much of the puppetry is emotive and powerful though one or two of the extensive puppet cast still need work on clarity of action. The storytelling largely hits the right pace and tone, with effective switches from high drama to warm comedy that completely captured and held the audience of over-fives, which can be challenging with non-familiar stories. There are still some wrinkles to iron out in this new production. I sometimes found the score too filmic and epic-sounding: puppets are all about theatricality and I felt the extra hype was uncalled for. Some of the floor level puppetry struggled with the sightlines in the ZOO venue. Yet this is a company who treat their material and audiences with respect and earn it back. Land of the Dragon is a magical show that’s moving and visually captivating – catch it while you can.